TORONTO, Dec. 23, 2011, /CNW/ – Staples Canada is giving shoppers a chance to cash in on Boxing Week deals while doing their last-minute holiday shopping. Starting on December 24th, tech-savvy deal seekers can start their Boxing Week bargain hunting early at Staples.ca. 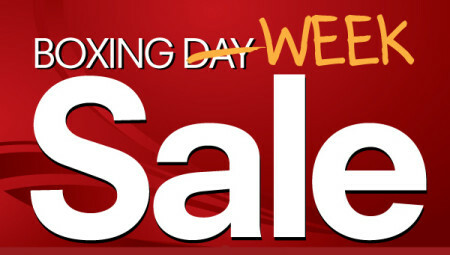 In-store Boxing Week sales will commence on December 26th, with store doors opening at 7 a.m. where permitted by law. On-site Easy Technicians are available to answer questions and help consumers find the best tech item to suit their needs. Online sales start at 6 a.m. on December 24th. For more great deals on the latest tech gadgets, visit Staples Canada online on Facebook or Twitter. For a complete listing of store locations and Boxing Week hours, visit http://www.staples.ca. Staples, Canada’s largest office products company, is committed to providing Canadians with a wide choice of office services and products. Serving all types of business—from the small home office to large enterprise—Staples makes it easy for customers to operate their offices efficiently and affordably by offering an extensive selection of office supplies, technology, electronics and office furniture as well as business services, including computer repair and maintenance, and copy and print services. Operating as Bureau en GrosMC in the province of Quebec and Staples® Canada in all other provinces, the company employs over 15,000 associates at 320+ stores and at their head office in Richmond Hill, Ontario. Ranked as one of Canada’s top five Canadian companies in Marketing Magazine’s Marketing/Leger 2010 Corporate Reputation Survey, Staples/Bureau en Gros is dedicated to offering customers the highest level of service, whether they choose to shop in-store, by catalogue or online. Staples Canada/Bureau en Gros is also invested in a number of corporate giving programs that actively support environmental, educational and entrepreneurial initiatives in Canadian communities from coast to coast.